I love BPI. I mean when i found out that having a BPI account is easier and faster than what i experienced with BDO i fell in love at first try. I just opened my BPI Express Teller and it automatically gives me the convenience of having my own BPI Express Online account that enables me to access my account via online anytime i want. But i had a problem just last week with my enrollment. Right after i receieved my physical ATM i already enrolled with the online banking through logging in at http://www.bpiexpressonline.com/ Upon erollment i went to the nearest BPI ATM machine and activate my account. I received an email that my account is ready to use after 24 hours but sadly, the online portal tells me that i entered the wrong username and password and to my shock, my account has been disabled. 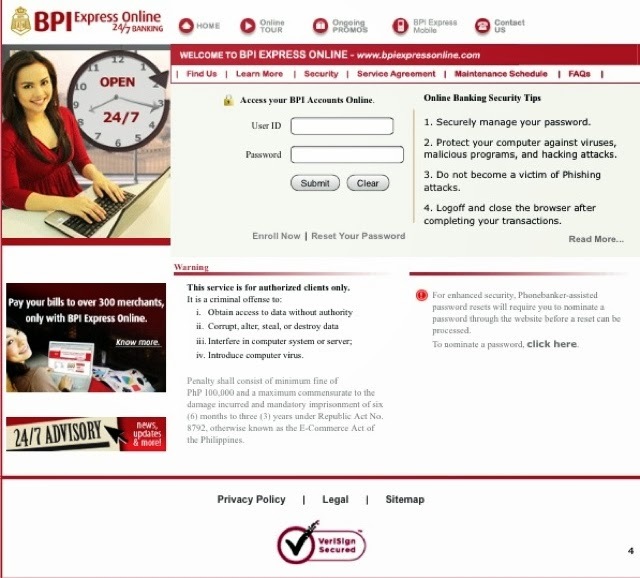 Now how did i retrieved my BPI Express Online Account Name and Password? First, call BPI hotline 89-100. You will hear first a voice message and then just click in “0” to talk with a phone banker. Be ready with your account number and be ready too to answer the verification questions of the phone banker. Next the phone banker will transfer you to an electronic bank officer who will ask you another set of verification questions and you will the have your account name retrieved though your password won’t be. The electronic bamk officer will give you a temporary password. Five minutes after the phone conversation you can now log-in to http://www.bpiexpressonline.com/ and you will have the option to enter your new password. Wait for another 5 minutes before you can now log-in to your account. Call in the morning preferably 8am-10am because based on experience they answer faster in the morning. Be patient because it may take 2-3 “sorry, all of our account officers are busy” before you can actually talk to a phone banker. Be patient too in answering the questions of the phone banker for verification. Talk nicely and if you can’t express that well in English then use the Filipino language. The most important thing is that the person on the other line will understand what you wanted to say. I forgot my username and my password, because I never really had time to log in after activating my account. I will use your tip and call them tomorrow morning. I went to my favorite BPI branch last week, and they told me to call, but I never did, since I wanted to know how the whole process goes. I was actually contemplating withdrawing all my money and opening another account when I saw this. Thank you very much for sharing. I have been back-reading your posts and they're really useful. More power to you! Glad I was able to help you dear. I visited your blog and will truly add it on my Reading List Florin. It happened to be just now. So frustrating. Is this process still apply when I will use a cellphone to call their hotline number? Thank you!